Enzymes run your metabolism, digest nutrients and generally carry the responsibility of keeping you alive and well. Foods contain enzymes, but most of these natural enzymes are destroyed during cooking or digestion. Your body produces enzymes, but when it needs extra support, you can buy supplements or consult your physician for prescription-strength enzymes. From producing blood and hormones, to turning food into energy and building muscles, organs, skin and bones, every last job in your body depends on enzymes. Enzymes catalyze chemical reactions, which means they turn slow-moving processes into blazing fast reactions. Each enzyme is specific to one molecule or compound and it remains unchanged during the reaction, which means the same enzyme stands ready to continuously repeat the process. If you're healthy, your body uses amino acids from the proteins you consume to produce all the enzymes you need. Digestive enzymes are essential for breaking large nutrients into pieces small enough to enter your bloodstream. Enzymes called amylases digest carbohydrates, lipases break down fats and proteases are responsible for protein digestion. Supplements containing one or more of these enzymes can help improve digestion and relieve gastrointestinal symptoms when your body doesn’t produce a sufficient amount. Supplements containing the enzyme lactase make it possible for some lactose-intolerant people to enjoy milk products. Beans and cruciferous vegetables contain complex sugars that are hard to digest and often cause gas. You can solve that problem with over-the-counter products containing the enzyme that targets those sugars, alpha-galactosidase. Proteins, including enzymes, change when they’re exposed to heat or acids. All of the single amino acids stay intact, but the protein loses its shape, which means it can’t function. Most of the natural enzymes in raw foods are destroyed during cooking and processing or from stomach acid. But there is an exception. Pineapples contain a protease enzyme, bromelain, that survives digestion and enters your bloodstream. 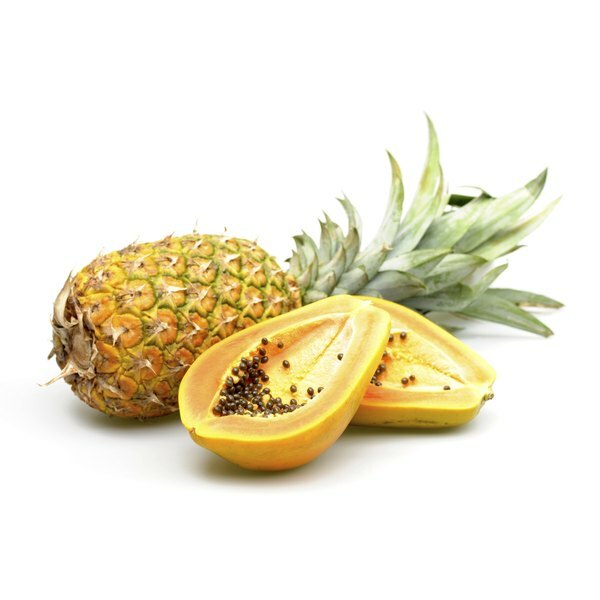 In addition to helping you digest proteins, bromelain may help thin blood, affect the immune system and fight inflammation, according to studies cited by NYU Langone Medical Center. Except for enzymes like lactase and bromelain, supplements should be enteric-coated to protect them from stomach acids. Take enzymes at the beginning of meals and snacks for optimal effectiveness. Swallow the tablets or capsules intact, without holding them in your mouth long enough for them to dissolve. Some enzymes may digest membranes in your mouth, causing sores or irritation. The most common side effect from taking pancreatic enzymes is constipation, but you may also experience nausea, cramps or diarrhea, according to the Pancreatic Cancer Action Network. If you take sedatives or antibiotic medications, consult your physician before taking bromelain. Don't mix bromelain or the proteolytic enzyme from papayas, papain, with blood-thinning medications. Berkeley Wellness: Enzyme Supplements: Yea or Nay? How Are Sugars Derived From Starch? What Denatures Proteins During Digestion?